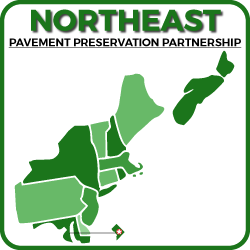 The Northeast Pavement Preservation Partnership (NEPPP) is comprised of representatives from regional state and local highway agencies, provincial transport agencies, industry, suppliers, consultants, and academia. Any interested agency, organization, company, or group may join and participate in the activities of this Partnership by contributing funds to the American Association of State Highway and Transportation Officials (AASHTO), or by paying fees to attend the annual workshop and conference. The Partnership seeks to develop sound pavement investment programs to gain infrastructure and operational efficiencies and satisfy the reporting requirements of GASB 34. While some states have developed preventive maintenance programs as a key step in preserving their pavement investment and extending their serviceability with cost effective preservation treatments, other states could benefit from a sharing of the knowledge gained from this experience. Such a partnership would develop sound preservation practices by a beneficial sharing of information on treatment designs, construction practices, performance measures, and research needs. The Partnership’s Vision Statement, Mission Statement, and Objectives are stated in the Partnership’s By-Laws. The Partnership is supported by voluntary contributions by member agencies made to AASHTO in cooperation with the Federal Highway Administration (FHWA) Office of Asset Management. The Partnership’s policies and major activities are determined by the members and implemented through an elected Steering Committee consisting of a Chair, Vice-Chair, Secretary / Treasurer, and Immediate Past Chair. In addition to the Steering Committee, there are ten elected Directors who represent the Partnership’s various constituencies. The Steering Committee conducts the business operations of the Partnership and participates with the National Center for Pavement Preservation (NCPP) in organizing the Annual Meeting. The Northeast Pavement Preservation Project can be found here.